The slow smile. The simple phrase. You take me back. It's what I live for. And this time, it was a humble taco filling that elicited the reaction. If you know me...even a little...you know my deep-rooted love for Mexican cuisine and culture. Maybe you also know that food memory plays a starring role in why I cook and why I write. And not just conjuring up my own memories, but memories of those around me. They always make for the best stories. The best responses. 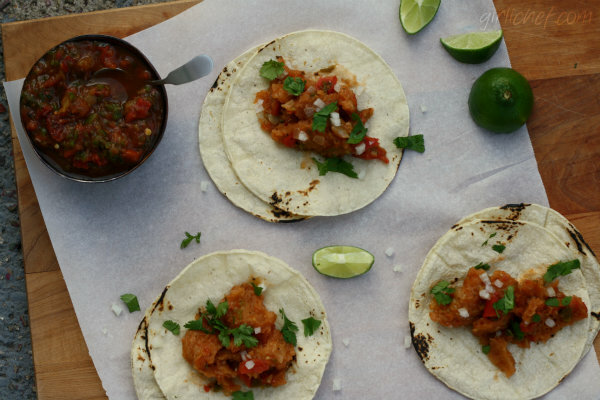 Tacos de chicharrón are something that mi esposo grew up with. Just one bite can unearth buried tales of weekends in his small hometown colored with people and places that shaped who he is today. It makes me wish I'd made them sooner. It's true. We've been married for almost ten years and this is the first time I've actually made some for him at home. And oddly enough, our taqueria's don't often have them on the menu. Sometimes, but not on a regular basis. He's talked about them before. We eat chicharrón now and again when the craving strikes. But I've never made him tacos. I blame it on texture. 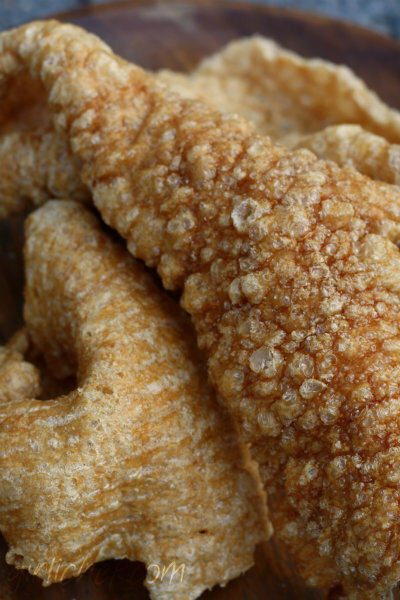 I love the crunchy, porky taste of the just-fried pork rinds. But once they turn somewhat soggy from the warm salsa-based sauce, they don't look as appealing. In fact, they remind me of tripe. Which I cook occasionally, try a little more often, and still can't stand. I eat around it, if it's on my plate. So I blame tripe for my dismissal of pork rind tacos. 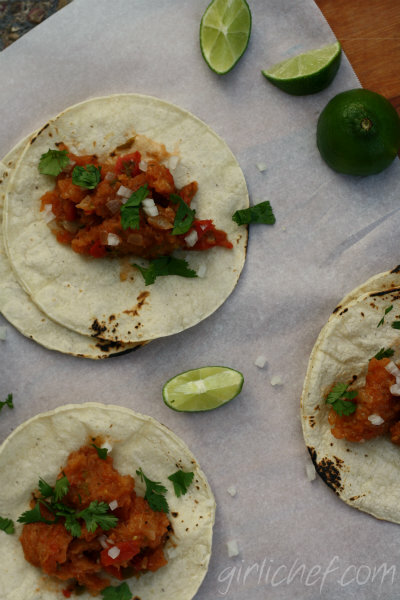 So when I was flipping through the soon to be realeased Muy Bueno Cookbook, and came across a recipe for Tacos de Chicharrón, I decided it was high-time that I make some for the hubby that is always there for me...encouraging me...and supporting me. I mean, they even started sounding good to me. So I went in for the kill. They were perfectly flavorful and wonderfully soft...without being soggy. And nothing like the rubber-bandy tripe that I imagined. I fell hard for something my hubby had been longing for for so many years. And my oldest son loved them, too. But it was that slow smile. It was that simple phrase. That was what made my first (of many to come) go at making Tacos de Chicharrón so rewarding. Roast all of the chiles over an open flame or under the broiler until the skin is black and blistered. Transfer them to a large zippered baggie or wrap in a kitchen towel and allow to steam for 10 minutes or more. Slide the skin from all of the chiles, and then pull out the stems and most of the seeds. Line the chiles up in a pile and run your knife through them a few times, just to get some wide, thick strips. Transfer the prepared chiles to the jar of a blender (or food processor) along with the garlic, tomato sauce, and salt. Pulse a few times, just to achieve large chunks. Dump in the fire-roasted tomatoes with their juices and pulse 2 or 3 more times. 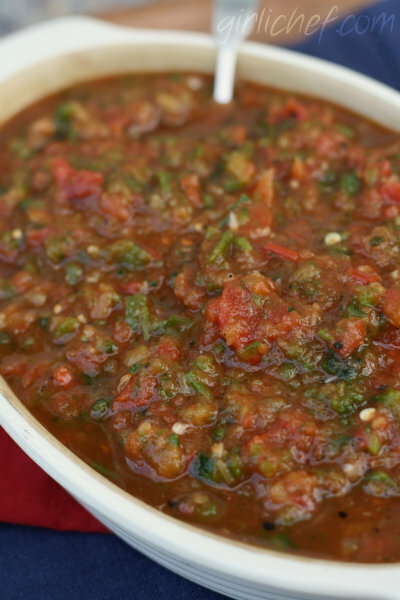 You should have a very chunky salsa. Heat oil in a medium-large skillet over medium heat. Add onion and cook until translucent, ~2 minutes. Add flour and cook for another two minutes, stirring often. Add the salsa casera and let it come to a boil. Break up the chicharrón into bite-sized pieces (~2" chunks) and add them to the pan along with the water. Bring back the boil and stir everything around to coat. Remove from heat and allow the chicharrón to absorb the liquid before serving, 15-30 minutes. Heat your corn tortillas (comal, open-flame, microwave) and pile the warm filling into them. Pass the onions, cilantro, and lime wedges for sprinkling on top. Enjoy! The original Muy Bueno recipe uses all 6-7 Anaheim chiles in place of the Guerritos and Poblanos, but it's rare for me to be able to locate Anaheim's locally, so I substituted. It also calls for one can (same size) whole tomatoes...which you should add to the blender/processor at the same time as the chiles and pulse everything together. This is actually one of the best salsas I've ever had and I will be making it for years to come. It's fantastic in recipes or just scooped up with tortilla chips for snacking. Please don't use "fake" pork rinds in this application (the kind you find in snack bags by the chips). Look for the large sheets of real pork rinds. If you have a local butcher or Mexican Market, it's a good bet you'll find some there.